What started off in Poland as a celebratory dance for fans of the Lech Poznan club has now become a mascot of Manchester City FC supporters' celebrations. The dance involves fans turning their backs to the field, linking arms and jumping up and down in unison. In many parts of Europe this dance is known among football fans as "Greque". The City supporters first adopted the dance in October 2010 during a Europa League match against Lech Poznan which they incidentally won 3-1 and labeled it "Poznan" as a homage to its originators. Initially the City fans were unimpressed with the bouncy movements and enquired the Polish club's fans what it was they were exactly doing. But they were eventually won over enough to adopt it. The Poznan went on to become such a compelling spectacle that it attracted as many as 1.2 million views on the YouTube when it first went viral. This celebratory form spread to Leicester City where fans of the club performed it in a third round encounter with Manchester City prompting the British media to coin it as "doing the Poznan". Down the years, the dance was used by fans of rival clubs to mock Manchester City. Cardiff City supporters did that when they beat City 3-2 in a August 2013 League encounter. Arsenal fans erupted into Poznan celebrations when Mikel Arteta scored the winning goal for the Gunners in April 2012. The same spectacle was repeated when Arsenal beat Manchester City in the 2014 Community Shield. Local rivals Manchester United's fans broke into a Poznan during a FA Cup tie with City in 2012. Leaving aside the mockery of rival clubs, the Poznan has become a trademark of Man City fan celebrations. The adoption of this celebratory style by the club fans has coincided with the rise of City fortunes. City fans haven't been short of excuses to perform the Poznan in recent years. The Premier League title in 2011-2012 became theirs after a huge gap of 44 years. The feat was repeated in the 2013-2014 season. Added laurels came in the form of the FA Cup in 2011 and the Community Shield in 2012. In the ongoing season, they are tied at the top with Chelsea in the Premier League tables and are sniffing at the title for a possible third consecutive time. 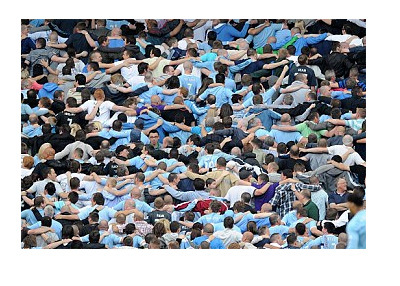 One can be sure Man City fans will find more and more occasions to break into a "Poznan dance" something that they made it their very own.